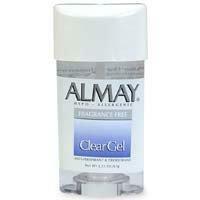 It can be difficult to track down in stores, but Almay deodorant has earned itself a devoted following over the years. Several varieties are available, so there's something for everyone from normal to the most sensitive skin types. Almay is the brainchild of Fanny May Woititz and her husband, Alfred. It was 1930, and she was highly displeased with the formulas and richness of the cosmetics of that time, which were usually quite thick and composed of harsh chemicals. Alfred, who was a chemist, was able to determine which ingredients were causing Fanny May irritation. The next step was quite clear to him: Together with a dermatologist, he created a cosmetics formula that was mild enough for Fanny May to use regularly. Thus, Almay was officially born in 1931. The moniker, of course, is a hybrid of Alfred and Fanny May's names, and the line caught on immediately with women everywhere. Touted as the first hypoallergenic cosmetics company, as well as the first company to formulate 100 percent fragrance-free products and to divulge all ingredients used in its products. The company also claims it is the first to conduct safety tests for allergies and irritants, and even touts itself as the first company to formulate specialized systems for specific skin types. The company has come a long way since its inception, and today boasts an impressive lineup of products, including color cosmetics, makeup removers and a small selection of skincare items. Among them are sun care products and deodorants. Fragrance-free antiperspirant and deodorant: This clear gel formula is perfect for anyone who regularly deals with white residue from typical deodorant sticks. It promises to dry quickly and lasts the day without leaving any mess behind. Powder Fresh antiperspirant and deodorant: Also a clear gel formula, this version is scented with a light fragrance reminiscent of baby powder. Soothing Aloe antiperspirant and deodorant: Another addition to the clear gel formula family, this is scented with a clean, fresh fragrance that many users consider quite mild and tolerable. Fragrance-free antiperspirant and deodorant solid: For those who don't love the feel of cool gel on their underarms, this is a great alternative. It provides the same non-irritating benefits of the others, yet is solid and smooth in application. Roll-on antiperspirant and deodorant: This unscented version goes on clear and features an easy roll-on applicator. It's a consumer favorite! Don't apply on irritated or broken skin. It's usually fine to apply deodorant after shaving, but if you generally feel some discomfort, it's a good idea to wait a while before application if possible. This will greatly reduce any chances of skin irritation. If a rash develops, discontinue use immediately. If you haven't yet tried Almay deodorant, it may be worth a shot - particularly if you've had limited success with other brands and formulas. Note that they are touted as non-irritating, non-stinging, dermatologist- and allergy-tested and hypoallergenic.